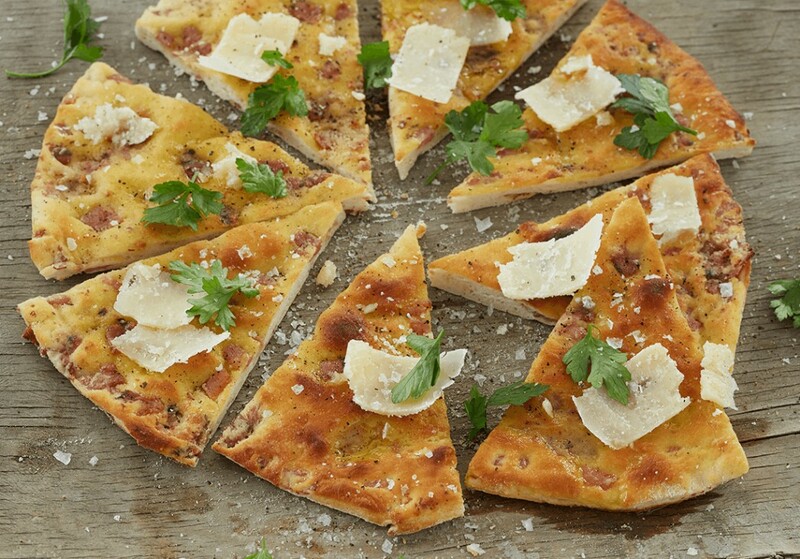 Take the traditional pizza base to the next level by adding bacon bits to it. Trust us, it’s worth it! Fry the bacon until crispy and allow to cool. Knead the cooled bacon bits into the dough and divide the dough into 2. On a floured surface roll the dough until it is very thin, and place it on a floured baking slide. Brush the dough with olive oil and bake in a pre-heated oven for 10-15 minutes, or until it is golden brown. Remove from the oven and top with the spring onions, garlic and salt & pepper. If you are adding cheese, add the toppings before baking.